Gladwell is an amazing storyteller and he captivates you with his resourceful topics ranging from hockey players to plane crashes. If you thought that success is all about hardwork; then you're wrong. Success has various factors along with hardwork. It has to do a lot with your upbringing, the place where you're from, you birth-date, the opportunities that come along the way and much more. "Success is not a random act. It arises out of a predictable and powerful set of circumstances and opportunities." "It's not enough to ask what successful people are like. [...] It is only by asking where they are from that we can unravel the logic behind who succeeds and who doesn't." The book starts with the process of selection of Canadian Hockey players and why the players who're born in the first quarter of the year are more successful than those that are born later quarters of the same year. Age is a differentiating factor for selection in Canadian Hockey. A boy who is born on 1st January, 1998 and a boy who is born on 1st December, 1998; both get selected to the same team as per the selection process. But the one born in January is more stronger and powerful and has an added advantage of almost a year of practice than the one who is born in the last quarter of the same year. At the core of the book, Gladwell emphasizes the rule of 10,000 hours. That's the number of hours of practice you need to be an expert in the field of your choice. He supports this rule with various examples from Beatles to Bill Gates. He also explains how demography and culture plays an important role in getting success; and failure as well. 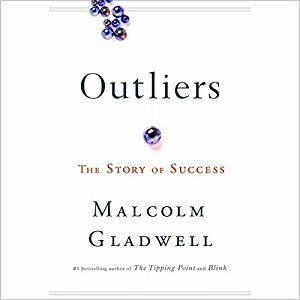 In short; Outliers is a compelling read on why few people succeed and why few fail - thought from altogether new perspectives and filled with varied examples. “It's not how much money we make that ultimately makes us happy between nine and five. It's whether or not our work fulfills us. Being a teacher is meaningful."